If you find yourself running away from fear, you’re running in the wrong direction. Fear demands that we move toward it, face it, and hear its messages. When we fail to do this, the price is high - chronic anxiety, sleeplessness, damaged relationships, skyrocketing pharmaceutical use, and more. 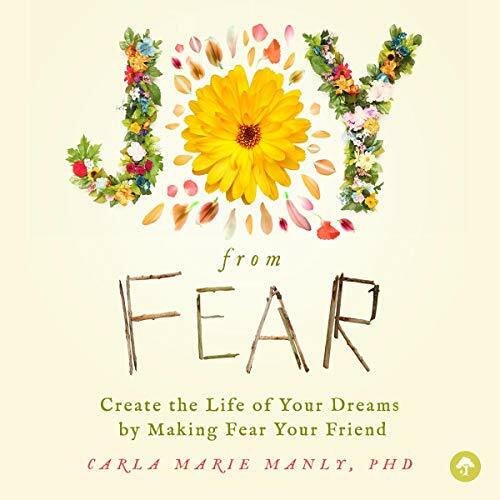 In her enlightening book Joy from Fear, clinical psychologist Dr. Carla Marie Manly explains that fear is not the enemy we thought it was; fear, when faced with awareness, is the powerful ally and best friend we all need. Dr. Manly's work is firmly based in science but goes far beyond presenting the dry facts. Joy from Fear offers many real-life examples, insights, easy-to-use tools, and life-changing exercises. Coining the term transformational fear, Dr. Manly illuminates the importance of embracing fear's messages for a transformed life filled with freedom and lasting happiness. The audio performance was fantastic!! And whether you read the book or listen to the audio ( I've done both) this information is life changing!! Below is my review after reading the book, and after listening to audio I would recommend to do both! As I say below you won't regret it 🙏 your life will never be the same as you'll be able to experience the Joy that has been there and you'll gain the faith to know it'll always be there.. I'm not a chronic reviewer at all but when a book like this can add so much value to a person's life I had to take the time and recommend this great work. We only get so much time here on this planet and every moment with fear is wasted but at the same time every moment lived in joy is cherished. We all need the tools to live our lives from a place of Joy and this book delivers! We all need less fear and more Joy and our loved ones whom are affected by our emotional states deserve our Joy not our fears. Get this book for yourself and the ones you love, I promise you won't regret it.